Crime scene photos show the aftermath of a 2016 burglary at Titan Arms in unincorporated Lakeland where 47 guns were stolen. The Ford pickup pulled into the strip mall parking lot just before 3 a.m., its headlights reflecting on the glass exterior of the Tampa Arms Company. The truck sped forward, shattering the shop’s entrance. Grainy black and white security video captured what happened next: As the truck backed out, at least a dozen people in hoodies rushed in, jumping over counters and tearing guns off the walls. They grabbed 36 guns and vanished within a minute. 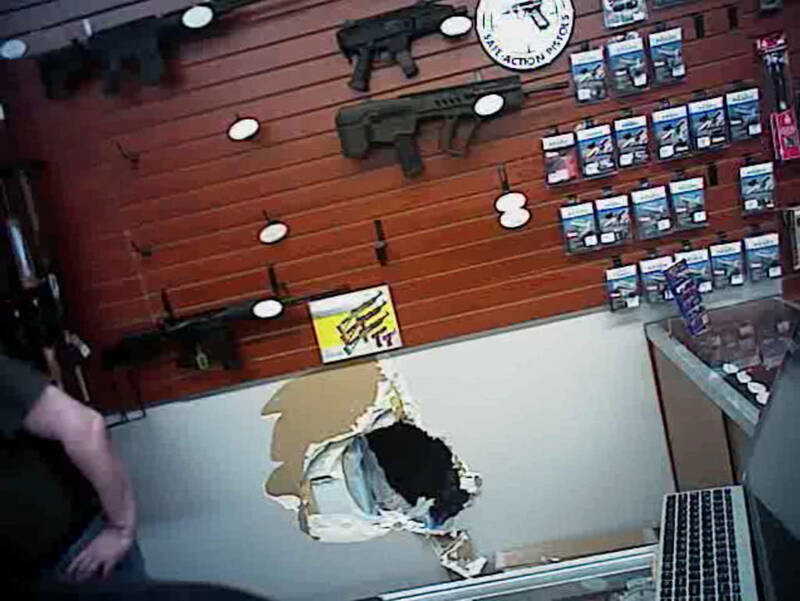 Brazen heists have been committed at gun shops across the state: Criminals hammered holes into concrete walls, looted stores after a hurricane, and ripped security gates from doors. Weak security practices at many gun stores have made commercial burglaries an increasingly significant source of weapons for criminals in Florida and beyond, an investigation by the Tampa Bay Times and Reveal from The Center for Investigative Reporting has found. 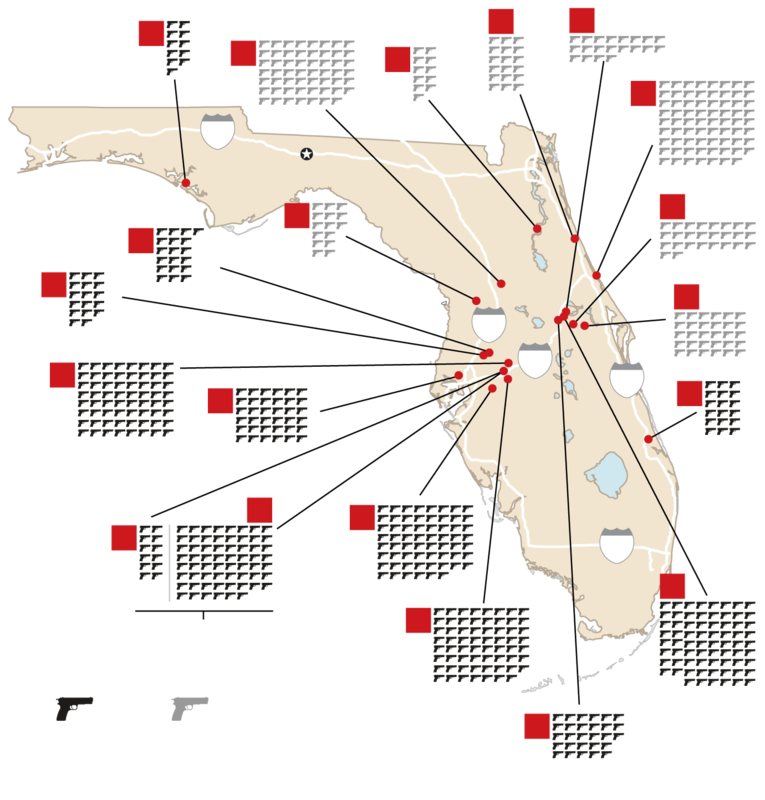 In Florida, more than four times as many firearms were stolen during gun dealer burglaries in 2016 than in 2012, according to data from the federal Bureau of Alcohol, Tobacco, Firearms and Explosives. During those years, licensed gun dealers, called federal firearms licensees by the ATF, reported 156 burglaries. The Times/Reveal examined 18 months of burglary reports from break-ins that each resulted in at least 10 stolen weapons. In at least 13 of the 20 break-ins analyzed, the guns were sitting in display cases or hanging from walls. No federal laws regulate gun storage, and only a handful of states have created laws requiring security at these stores. Florida isn’t one of them. That means shop owners decide for themselves what security measures to take. At some dealers, guns weren’t secured at night, and the only thing standing between thieves and weapons was a pane of glass. That obstacle, the Times/Reveal review shows, can be obliterated without much sophistication. Sometimes it simply takes a rock. “It’s one-stop shopping. Instead of breaking into 15 homes and maybe finding five guns, you’re breaking into one shop and getting 50,” Burton said. Daryl McCrary, special agent in charge of ATF’s Tampa Field Division, which regulates licensed dealers in 58 Florida counties, said it’s unclear what’s driving the increase in thefts from gun stores. But his investigators know thieves are scoping out businesses before they break in, examining how the guns are stored and whether they’re kept in safes overnight. In some burglary reports, owners told police they saw new customers, possibly suspects, browsing and asking questions days before the hit. “It’s a phenomenon that we’re seeing not only in Florida but throughout the states,” McCrary said. The thefts are fueling a black market of firearms for people who can’t get them legally. They can resurface in violent crimes or end up in the hands of convicted felons. After the 36 firearms were stolen in November from Tampa Arms, a small shop in Hillsborough County, one of them was recovered a week later. Deputies found the .38-caliber revolver on a 17-year-old from Orlando. He was wanted for murder. Surveillance footage shows a burglary that took place on April 20, 2016, at Value Cash Pawn in Alamonte Springs. 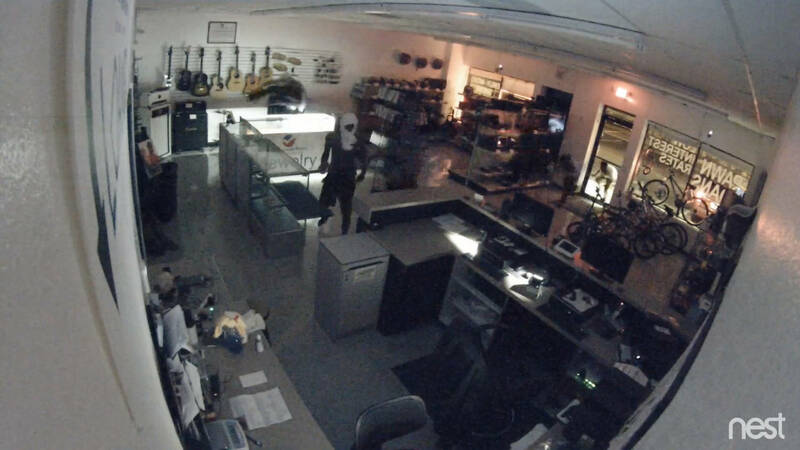 The first time thieves broke into Jason Mueller’s Value Cash Pawn store in Altamonte Springs, he chuckled as he watched the surveillance footage. Teens made off with two gun powder rifles stored behind the counter. His real arsenal was safely behind a bolted door in a back room. † Numbers in parenthesis are burglary report totals. Still, Mueller and co-owner Stanley Wong stepped up security, installing steel grates on doors and windows and adding glass break sensors. The next thieves to break in were more calculated. They somehow cut the power, so security cameras weren’t recording. They pried off the steel gate Mueller had just installed on the front door and broke into the locked back room. They took 69 guns, making the gun shop heist one of the largest reported in Florida last year, police reports show. Only about a dozen guns have been recovered. 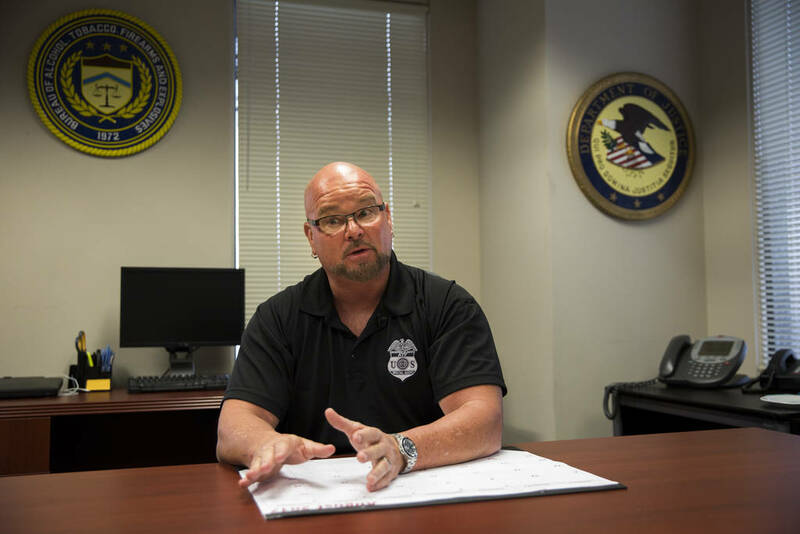 Thieves are “getting more and more sophisticated,” said ATF supervisor Michael Coad, who oversees investigations at the Tampa Field Division. 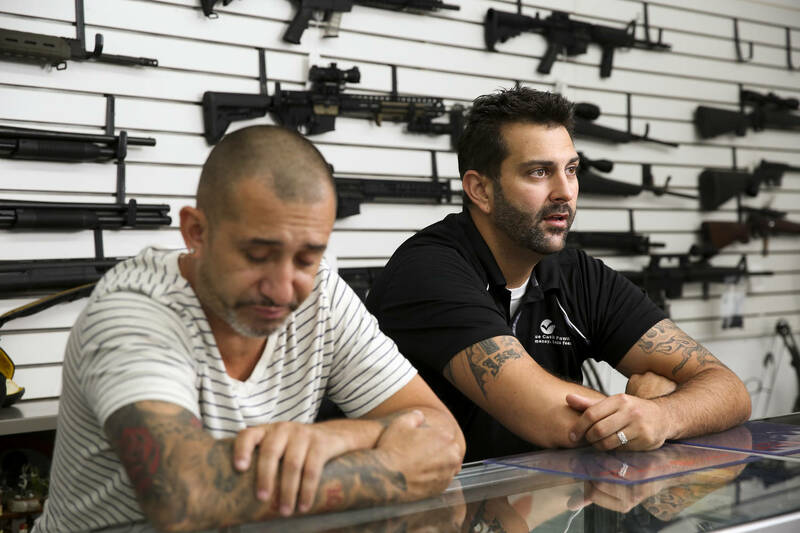 Alongside the Miami Field Division, the two offices regulate the roughly 4,000 gun dealers in Florida. Reports obtained by the Times/Reveal show thieves pierced security measures with ease. At the Grey Wolf Armory in Pasco County, one gun was taken on March 14, 2016, after burglars hammered a hole into a wall. They did it again three months later, this time taking 17 guns through a second opening in the concrete. Footage from body cams show a hole burglars created in the wall and crawled into the Grey Wolf Armory in Wesley Chapel on May 1, 2016. At some shops, thieves pried off exterior gates protecting front doors. In at least two cases, both in the Tampa Bay area, they drove a truck through a glass storefront. They know how to hide their identities, slipping into stores in painters’ clothes and concealing their faces under hooded sweatshirts. They’re fast, too, disappearing before police arrive. At the Sunshine State Armory in Zephyrhills, suspects who smashed a truck through the entrance were gone in 30 seconds. Mueller now stores his guns in safes every night. Around 3 a.m., he sometimes still jolts awake and checks his security cameras from his phone. “We can’t have this happen again,” he said. He’s reinforced security at his store. But he’s worried that other shops haven’t and thinks security practices should be a requirement. “I’d like to know how many of those guns stolen led to the deaths of other people,” he said. Owners Stanley Wong, left, and Jason Mueller talk about gun security measures at Value Cash Pawn in Altamonte Springs. “We can’t have this happen again,” Mueller said. 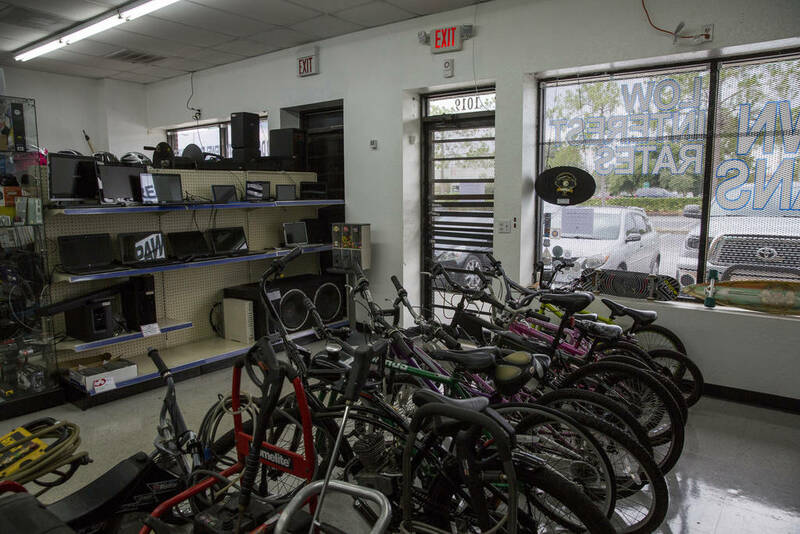 After the break-in, the owners of Value Cash Pawn reinforced the entrance with metal bars and grates as an additional security measure to prevent burglaries. Guns fill a safe at Value Cash Pawn. The store owners take the guns out of their display cases and lock them away in safes each night for added precaution. In the past year, ATF agents have visited gun shops and organized seminars to talk about security. The agency has published a 40-page manual that outlines tips, like securing air conditioning window units, installing steel mesh inside walls, and investing in alarm systems. The best deterrence, according to the ATF: secure guns after business hours, either by locking them in a safe or securing them with a cable lock. Thieves are “getting more and more sophisticated,” said Michael Coad, who oversees investigations at the Tampa Field Division of the Bureau of Alcohol, Tobacco, Firearms and Explosives. If a gun shop owner has installed security measures to deter burglars, they will typically receive a discount on coverage, said Lynne McChristian, catastrophe response director of the Insurance Information Institute. Think of jewelry store owners, McChristian added, who scoop up merchandise from displays at closing time and keep them in safes at night. “Gun shop owners can adopt that same type of habit,” she said. 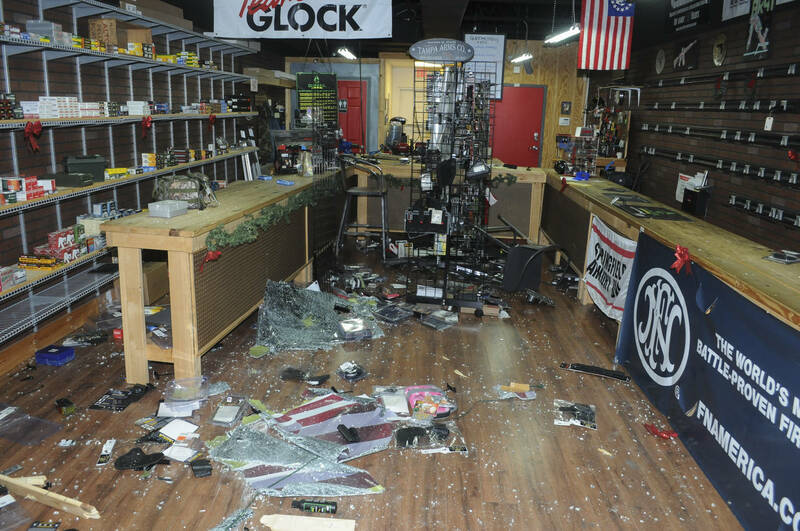 The first time thieves busted into Guns Galore in Lakeland, they popped off the door lock and took 11 handguns and a rifle from display cases. The gun store owner, Alfredo Delatorre, glued the lock back in place on the door, police reports state. A month later, Polk County Sheriff’s deputies were back. The front door was pried open again. Inside, thieves had smashed the display cases and made off with 46 guns. In their report, investigators noted that Delatorre did not have security cameras at his store. He couldn’t be reached for comment for this story. In Inverness, Andrew Hallinan, owner of Florida Gun Supply, said he stores his shop’s arsenal in safes every night. But on the night of Dec. 5, after organizing a promotional sale, he decided to leave them on the counter. The next morning, a man walking his dog noticed the shattered glass in front of the store and called deputies. Thieves had taken about 15 guns. Hallinan said gun shop owners are unfairly blamed for not storing guns in safes after business hours. Safes can be expensive, he said, and sometimes only delay thieves in getting to the weapons. Still, he’s contrite about his own failures. At least five other states and the District of Columbia have been more proactive in enforcement, mandating security requirements ranging from safes to vehicle-resistant barriers. In Minnesota, the state’s roughly 1,700 gun dealers are required to store guns in safes or a steel-enclosed room after business hours. According to ATF data, the state had four burglaries in 2016. In Florida, where there are nearly 4,000 dealers, there were 39. 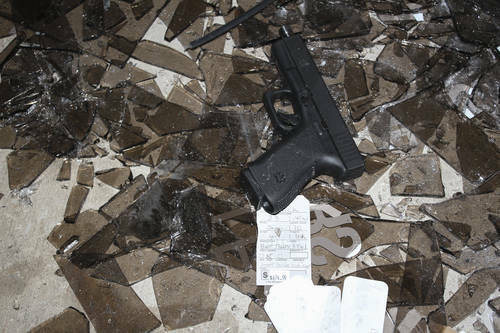 Crime scene photos from a burglary where more than 36 firearms were stolen Nov. 29, 2016, from Tampa Arms Company in Tampa. Suspects used a pickup truck to smash the glass facade. 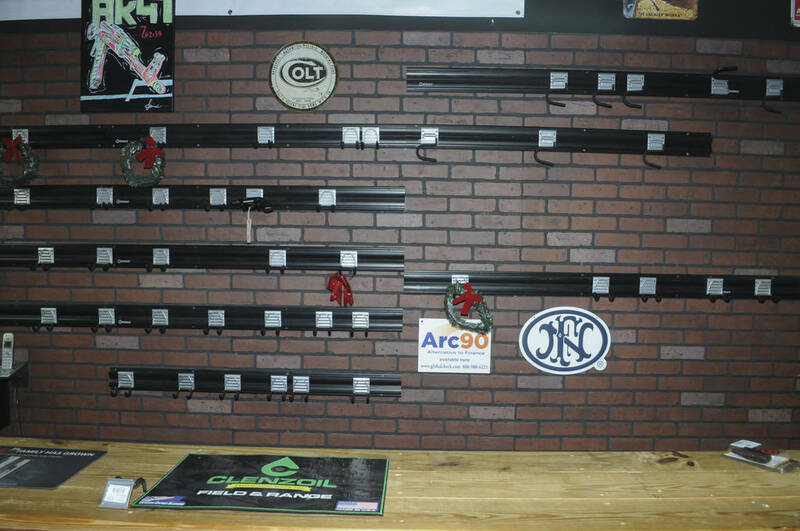 The wall where guns were displayed at Tampa Arms Company was stripped bare. The moment a Hillsborough sheriff’s deputy knocked on Thom Hauser’s front door at 3:30 a.m., he knew. “This is about the gun shop, right?” he asked the deputy, who nodded. Hauser followed the patrol car to his shop, Tampa Arms Company, at 4023 W Waters Ave. As he drove, he pictured what the damage looked like. Maybe the burglars threw rocks at a window, or tried to get through the bars. When he got there, the entire glass entrance was in shards on the pavement, his business completely exposed. The walls, lined with guns the previous day, were bare. The thieves took handguns, rifles, a crossbow and boxes of ammunition. Investigators later recovered video surveillance that trailed the suspects. On Nov. 28 at 11:50 p.m., cameras had first spotted the four stolen cars, plus the Ford pickup, at a 7-Eleven in Orlando. Their first target, according to police reports, was The Armories gun store in Kissimmee. But the thieves rammed a pickup into the wrong wall, crashing into the scooter store next door. They took a cash register with $100 in it anyway, leaving behind $20,000 in damage. Hours later, they pulled into the parking lot of Tampa Arms. It didn’t take long for one of the guns to end up back on police’s radar. The following week at a Citgo gas station in Orlando, a fight between two groups of teens in front of a high school erupted in gunshots. Caught in the crossfire was Kendra Lewis, who was pulling out of the gas station with her young daughter in the back seat. A stray bullet struck the 27-year-old in the head, killing her. Among the shooters were Jayvon Joachin, 16, and Deshawn Miller, 17, police reports state. They were arrested three days later, when deputies found them driving a stolen car in Polk County. Miller was carrying a Smith & Wesson .38-caliber handgun. Detectives entered its serial number — DCP0473 — into a statewide database and discovered it was from Tampa Arms. The Orange County Sheriff’s Office, citing the active case, declined to say if it was the murder weapon. Seven others arrested in connection with the break-in are awaiting trial on several charges of armed burglary. Only three more of the 36 guns stolen from Tampa Arms have been recovered. It’s been nearly a year since the break-in and a new glass storefront has been installed. Steel caging covers the walls, protecting guns and rifles that are padlocked overnight. Outside, where the Ford pickup smashed through the doors, concrete pillars jut from the ground. Hauser said he already had video surveillance, alarm systems and bars on the glass front. He didn’t have his guns in safes because he felt he had done enough. After the break-in, he got calls and Facebook messages from people who blamed him for the burglary. Strangers told him he was a bad person. Hauser said it made him question whether he had done enough to keep his shop safe. But he’s learned to separate himself from the criticism. More than 80,000 guns have gone missing in Florida over the last decade. For this story, the Tampa Bay Times/Reveal from The Center for Investigative Reporting analyzed annual statistics from the Bureau of Alcohol, Tobacco, Firearms and Explosives and requested dozens of police reports from 17 law enforcement agencies in Florida. The Times/Reveal used the ATF statistics to note the increase in the number of guns stolen during burglaries. 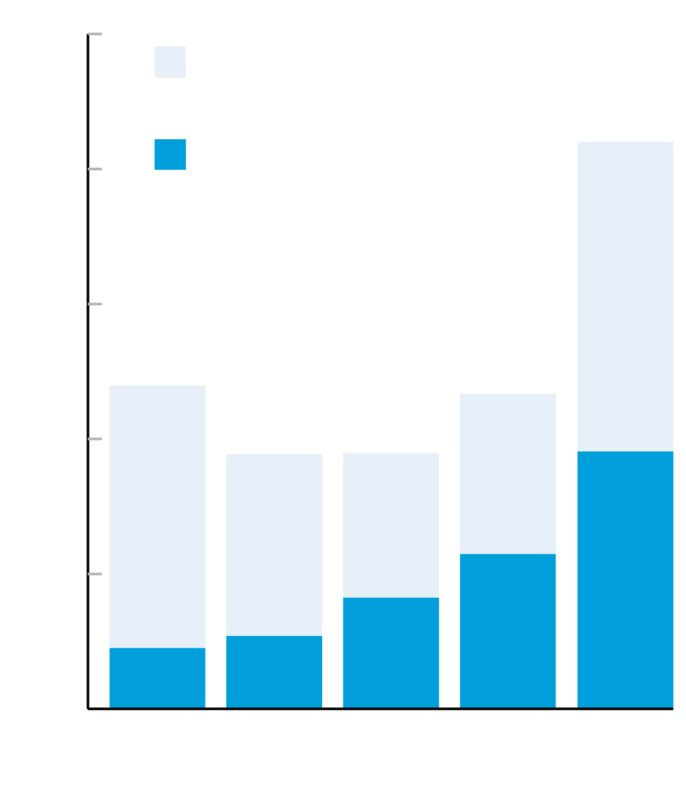 These numbers represent thefts that are reported to the ATF. Although gun dealers are required by federal law to report thefts and losses, there may be cases where they fail to notify ATF. 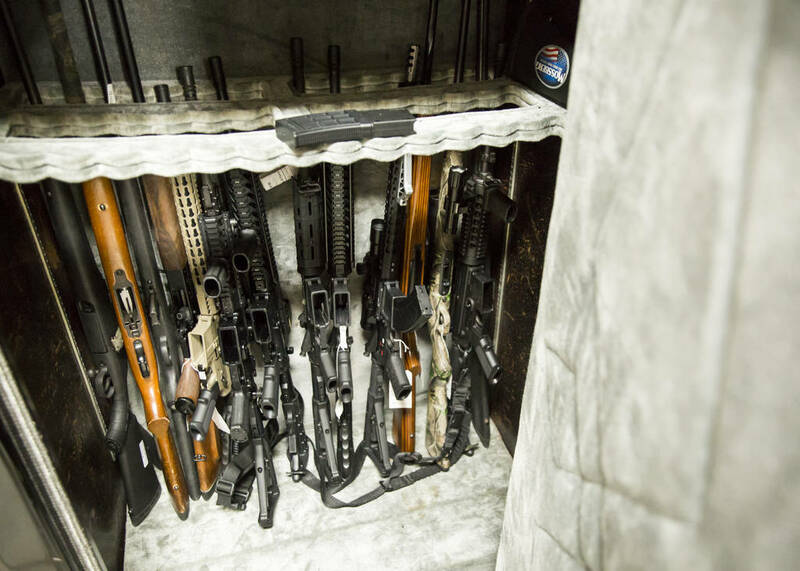 Citing a law that placed restrictions on the disclosure of certain kinds of firearms records, ATF denied a reporter’s request for theft reports submitted by Florida gun dealers in 2016. To identify these cases, the Times/Reveal used a state database to find every theft that each resulted in at least 10 stolen guns. A reporter then called every investigating agency, 38 in all, to determine if the burglary occurred at a gun dealer. In all, the Times/Reveal identified 20 such cases from January 2016 through June 2017 and collected police reports for all of them except two. Those records were not available because the investigations remain active, but the Times/Reveal gathered information from statements and video surveillance released by police. covers criminal courts in Pinellas County. 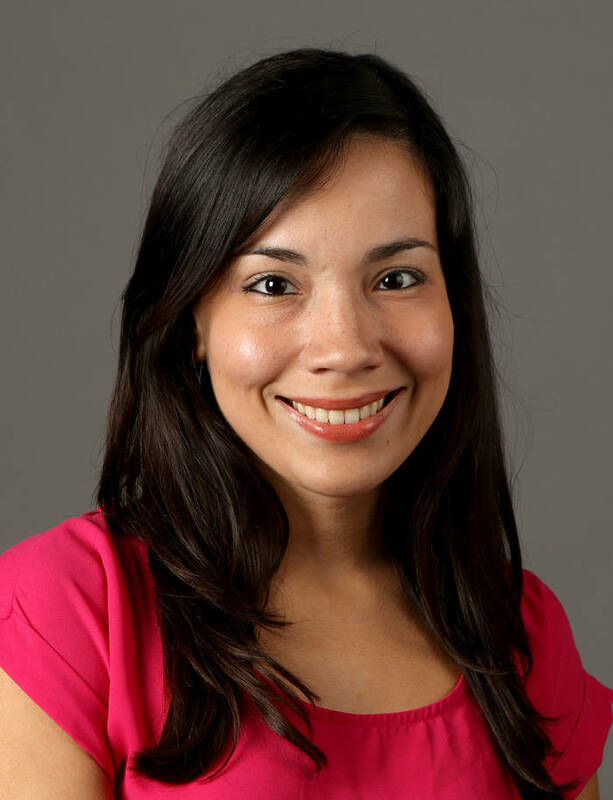 She joined the Tampa Bay Times in May 2012. Born and raised in Miami, she holds degrees from Miami Dade College and Emerson College. Contact her at [email protected]. Follow @lauracmorel. Morel produced this story as a Reveal Investigative Fellow. The fellowship, supported by the W.K. Kellogg Foundation and Democracy Fund, provides journalists of color support and training to create investigative reporting projects in partnership with their news outlets.